What Is Magnetic Hysteresis & How Does It Impact Powder Metallurgy? What Is Magnetic Hysteresis & How Does It Impact Powder Metallurgy?. Looking for the right material and process for your metal project? You can learn a great deal about the properties of a material by studying its magnetic hysteresis loop. A hysteresis loop shows the relationship between the induced magnetic flux density (B) and the magnetizing force (H). That’s where the infamous B-H curve comes from. We’ll explain the alphabet soup in greater detail in a minute. If you’re totally familiar with electromagnetic materials, forget this article. But if you’re curious about how a magnetic hysteresis loop applies to powder metal and your project, read on. Prior to discussing a typical B-H curve, it’s worth briefly covering the magnetic domain theory. It’ll be quick -- promise! Magnetic domains are similar to the grain structure of all metals, just smaller. Think of them as mini-magnets within a material. Domains are randomly oriented within a non-magnetized ferromagnetic material, which effectively cancels any net magnetic moment. A fully magnetically saturated material will have all domains aligned in one direction (let’s say to the top of this page). A fully demagnetized material will have various domains randomly oriented in the two dimensions of the page, canceling each other. Obviously, magnetism is a 3D phenomenon, but the same analogy can still apply. How does this relate to the B-H curve? The B-H curve (basically another way of saying the hysteresis loop) represents the necessary applied field (x-axis) required to achieve a certain level of magnetic induction (y-axis). In terms of the domain theory, the microscopic domains are reorienting in the direction of the applied field, thus overcoming some of their random orientation. When enough field is applied, all domains will be oriented in one direction and the metal will reach magnetic saturation. Further increases in applied field will not alter the domain orientation. So, magnetism is not any large-scale change in the material but rather a musical chairs of microscopic magnetic domains. The chart below is representative of most ferromagnetic materials (fully demagnetized or magnetically annealed before testing). This shows a current inducing a magnetic flux on the sample material. With increasing current, the induced magnetic flux also increases. At the normal levels of applied field, when the field is reduced to zero, there is some residual magnetism remaining in the sample. It requires a certain level of current in the opposite direction to effectively demagnetize the material. This lack of reversibility is called hysteresis; it actually implies some energy loss during the magnetize-demagnetize cycle. This is why the initial magnetization curve is not retraced when the applied current is reduced to zero. µmax -- the slope of the initial magnetization curve is referred to as “µ,” or the permeability of the material. Often a material is characterized by the maximum permeability, µmax. This is simply the instantaneous maximum slope of the magnetization curve. Br -- the residual magnetism for the given conditions when the applied field is turned off. Relative to the domains we talked about earlier, this represents how many domains remain reoriented as a result of the applied field. Hmax -- magnetic force (measured in oersteds). This measures maximum magnetic intensity applied within a metal. Bmax -- magnetic flux density (measured in kilogauss). This is defined as the amount of magnetic flux in an area taken perpendicular to the flux's direction. Induction level -- the level to which a material is magnetized by an external field. Measured in gauss, kilogauss, or tesla. Hc -- the coercive force of a material. If you have a material that wants to be reversed from plus to zero, this is the amount of energy you have to put in to reverse it. The lower the number, the less energy you have to consume. Applied field -- how much current (aka energy) do you have to put in to get a certain voltage? Measured in oersteds. Visa bar -- a perfect material would be infinitely up and infinitely down on this chart, with no broadening. That’s physically impossible, so this bar is a measure of how good the material is. Note the B-H curve has a mirror-like appearance above and below the x-axis. This means the direction of the current does not alter magnetic behavior. Although the curve above is for DC magnetic testing; it can also be used to evaluate materials for AC applications. In many cases the AC curve will begin to distort relative to the DC B-H curve. This distortion is a result of the eddy currents generated with the test material. The hysteresis loop shows that magnetization is easier for materials that contain large particles. For soft magnets, their ability to easily magnetize and demagnetize makes them ideal candidates for both AC and DC applications. 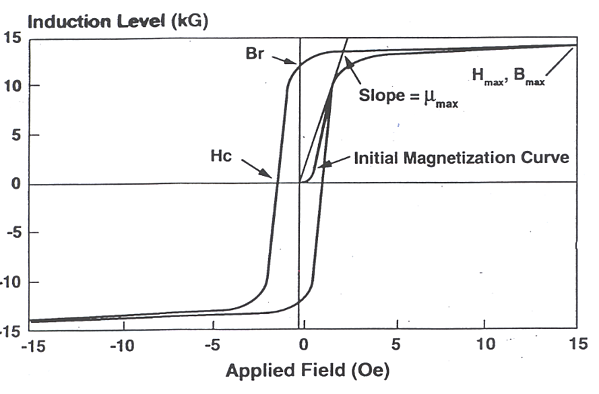 The “B-H” curve above is a method to evaluate the magnetic performance of materials in both the DC and AC conditions. It’s useful because it quickly shows magnetic performance of a material and can be readily used to compare it to others. Soft magnetic materials see wide use as cores in transformers and inductors to enhance and/or channel the produced magnetic flux. The dissipation of energy in a magnetic core during its magnetization and demagnetization cycle is called core loss. These losses are not a big issue for hard magnets, but they’re crucial to the efficiency of soft magnetic applications -- and can be controlled with proper material selection! Hysteresis losses originate from the movement of the domain walls back and forth under a magnetization-demagnetization loop. The presence of impurities, imperfections, and other features in a metal block can increase these losses. They exhibit a linear relationship with the frequency of the applied field. Eddy current losses are losses generated during AC applications of ferromagnetic materials. Think of them as the resistance of the material to the changing magnetic fields. Specifically, the eddy currents oppose the alternating current and generate heat with the ferromagnetic material. These losses can become significant as you up the operating frequency. Wire losses are, as the name implies, inefficiencies generated by the heating of the copper wire. Energy is consumed during this heating. One way to think about this loss is how a household extension cord gets hot when it’s been on a long time. Unlike the extension cord though, heating of copper wires in AC devices is factored into the design. Powder metallurgy has attracted the interest of engineers and purchasers looking to develop new and advanced electromagnetic products for both AC and DC applications. DC applications are best served by sintered soft magnetic materials. AC applications are best realized by using soft magnetic composites. Either way, powder metallurgy is coming into its own because of its low production costs, minimal material waste, and ease of recycling. The expanding interest in iron-based composites in electrical devices, such as motors, is in part thanks to the properties shown on the chart above. Some of these qualities apply to both soft magnetic composite and sintered soft magnetics. If the part does require secondary processing, the part can be annealed to avoid associated adverse effects. Residual magnetism (hr) can be improved by the same factors that improve the permeability. Also called remanence, it can be used to provide the magnetic memory in magnetic storage devices. Want to Go More In-Depth? The qualities of soft magnetic composites and whether they fit your design needs are highly reflected in the hysteresis loop. If you need more help understanding how magnetism and material choice impacts your product’s performance, get in touch with us. If you or your engineering team want to do more research on magnetism and materials, here are additional materials on magnetism and powder metals’ relationship. “Soft Magnetism, Fundamentals for Powder Metallurgy and Metal Injection Molding”, Chaman Lall.